Did enterovirus D68 cause limb paralysis in children? Dan Dugan of Seabrook, N.H., with his father, Pat, and stepmother, Kate Knowles, was unable to use his legs after becoming ill in October. He still needs help walking. A common virus swept the nation with uncommon force this fall. Wheezing youngsters filled intensive care units. In rare instances, children’s limbs weakened or stopped working. “It came at us from left field,” said Dr. Scott A. Schroeder, chief of the Division of Pediatric Pulmonology and Allergy at Tufts Medical Center. Tufts’s pediatric intensive care unit saw double the usual number of patients during September, as the bug identified as enterovirus D68 triggered severe asthma attacks, mostly in children with underlying lung disease. And then, just as suddenly as it arrived, enterovirus D68 went away — but not before it left lingering mysteries. Chief among them: the 90 cases of limb weakness or paralysis identified nationwide since August in people age 21 or younger. Was enterovirus the culprit? Will it happen again? One of those affected was 13-year-old Dan Dugan of Seabrook, N.H. He had been sick with a headache, cough, sore throat, and vomiting but was starting to feel better. Then, on Oct. 1, he got up about 3 a.m. to go tothe bathroom, fell down, and could not make it back into bed. “He said, ‘My legs aren’t working,’ ” his father, Patrick , recalled. At the Floating Hospital for Children at Tufts, Dr. Anthony Rodrigues, a pediatric neurologist, found no evidence of any virus in Dan’s system, but an MRI showed damage to his spinal cord. “This is a very worrisome development, having these kids with limb weaknesses,” said Dr. Alfred DeMaria, the Massachusetts state epidemiologist. Because the cases coincided with the enterovirus D68 outbreak, “it would be reasonable to postulate that it was the cause,” he said. DeMaria said five to 10 cases of neurologic illness occurred in Massachusetts, but the exact count will not be known until the Centers for Disease Control and Prevention finishes collecting data. Researchers are looking at the possible connection between viruses and limb weakness in some young people. Researchers know that enteroviruses as a group have caused paralysis in the past. Polio, for example, is an enterovirus. And nearly half the children whose neurologic symptoms are under investigation by the CDC tested positive for enterovirus D68, Sejvar said. “We are perhaps one or two steps shy of definitively stating that [the virus] is causing these cases,” he said. The big problem is this: Although the virus was identified in some children’s noses or stools, so far no sign of it has been found in any victim’s cerebrospinal fluid, the liquid that bathes the brain and the spinal cord. But not all have been tested, and the CDC will continue to collect spinal fluid and search for the virus. The agency also plans to measure antibodies to enterovirus D68 in two groups of children: those who suffered paralysis and a similar group who did not. If a higher percentage of paralyzed children have antibodies to the virus, that would be further evidence of its role. At Boston Children’s Hospital, two girls and four boys met the CDC definition of acute flaccid myelitis. All had a respiratory illness before they developed limb weakness, yet all tested negative for enterovirus, said Dr. Mark Gorman, a Children’s Hospital neurologist. Gorman’s patients ranged from 6 months to 15 years old. Four were unable to walk at the peak of their illness but are walking now. Why did the enterovirus, which typically causes gastrointestinal or respiratory illness, end up affecting the nervous systems of a few children? Academic studies are seeking to get to the bottom of it. Priya Duggal, an associate professor in epidemiology at the Johns Hopkins Bloomberg School of Public Health, plans to examine why, among the millions of people who were probably infected with enterovirus D68, only dozens suffered paralysis. Duggal wants to search for an answer in their genes, comparing the genomes of those who became paralyzed with those who were infected but did not suffer paralysis. For now, however, there are few answers for Dan Dugan, including to the biggest question: Will he walk again? He is back at home in Seabrook after three weeks at Tufts and a month at Spaulding Rehabilitation Hospital. At Spaulding, he learned how to transfer himself from a bed to a wheelchair and to walk short distances with braces and a walker. 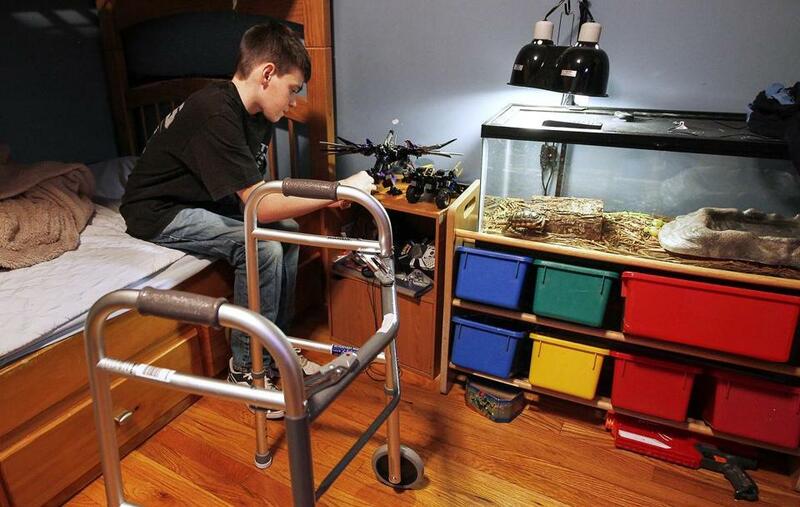 The eighth-grader plans to return to school part time this week, still using a wheelchair. Rodrigues, his Tufts neurologist, said the damaged nerves in Dan’s spine are the type that do not regenerate, but peripheral nerves can sometimes compensate. A few children with this type of nerve injury see little improvement, and a few regain full function, Rodrigues said. Most do get better but don’t regain their previous strength. Dan’s father said the boy has found strength from neighbors in Seabrook, a seaside community of 8,700. Local businesses put up signs saying, “Pray for Dan” and held fund-raisers to help pay medical bills the family’s insurance doesn’t cover. Contributions have also come from a fund-raising Web page. And Dan’s classmates took up one of his favorite hobbies — origami — making 1,000 paper cranes for him, recalling a Japanese legend promising good luck.